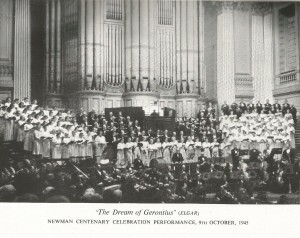 Dream of Gerontius, 9th Oct 1945. 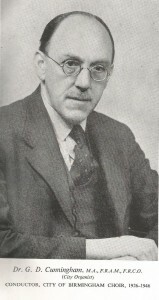 The City of Birmingham Choir was founded in March 1921 and its first president was no less a figure than Sir Granville Bantock, who was Principal of what was then called the Birmingham and Midland Institute School of Music, and who was a recognised composer in his own right. The new choir presented its first concert at the Town Hall on the 28th November 1921, conducted by Joseph Lewis. Later conductors included GD Cunningham (1926-46), David Willcocks (1950-57), Meredith Davies (1957-64), and Christopher Robinson (1964-2002). 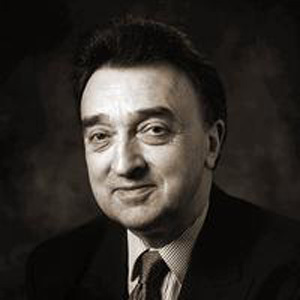 Adrian Lucas became conductor in 2002. The choir promotes and participates in an ambitious series of concerts each season, principally in Symphony Hall, but also in Town Hall, the Elgar Concert Hall, Tewkesbury Abbey and elsewhere. A recent development has been international tours – Paris (2015) and Vienna (2017). A celebratory year 2021 is being planned for the Centenary of the choir. Handel’s Messiah with the CBSO: Not every Messiah concert is listed. Performed by the choir in 1921, 1935 and 1936, it was not until 1943 that the work became a tradition of the season. Handel’s great oratorio has been performed every year since then with the CBSO in Town Hall and latterly (since 1991) in Symphony Hall. Christmas: A series of “Carols for All” Christmas concerts started in 1979, later renamed “Christmas Celebrations” and then, in 2011, “Christmas Treats”. More recently, the choir has enjoyed taking part in the “Christmas Classics” concert promoted by Raymond Gubbay . WGA Russell, 1946; Hugh Jennings, 1981; David Baxendale and Bob Casselden, 2001. This latter book covered “The Robinson Years“. We await a “Lucas era” volume! There have been two previous publications which have set out to document the history of the City of Birmingham Choir. The first was published in 1946 on the occasion of the Choir’s twenty-fifth anniversary. 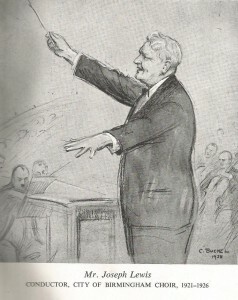 It was an austere but optimistic time, just after the end of the Second World War, and the author, William G A Russell, not only reviewed a quarter of a century of successful choral activity but also looked forward to further success now that the restrictions of the war years were over and there was a general atmosphere of reform and progress. His review was complemented by a complete list of the works performed to date. The second review came about in 1981, which was the sixtieth anniversary of the Choir’s foundation. On that occasion Hugh Jennings compiled a fairly brief description of the events since 1946 to accompany a catalogue of works performed over thirty-five years and the soloists who participated in the various concerts. The eightieth anniversary in 2001 might have provided an excuse for another such publication, but the real occasion behind this book is the retirement of Christopher Robinson as Musical Director after thirty-eight years. This period represents almost a half of the Choir’s existence and so very few of the present members have sung under anyone else’s leadership. By contrast, earlier conductors held tenure for five years (Joseph Lewis), twenty-two (G D Cunningham), and seven each (David Willcocks and Meredith Davies).